Gecko NZ Trust was founded in 1995 in Wellington by Chris Ferkins and Katherine Short. Their aim was to encourage conservation in New Zealand communities by mentoring conservation projects, and facilitating conservation-related employment and relationships between businesses and communities wishing to care for their local biodiversity. Gecko NZ Trust is now a firmly established non-profit organisation fulfilling its goal to support better social and ecological outcomes in communities. Our tailor-made programmes combine innovative and creative leading edge practices along with our experience in ecological restoration, community engagement and entrepreneurship to successfully deliver our programmes. We believe that a healthy relationship between nature and communities is essential to community and ecological wellbeing, and that our role is to mentor and facilitate community-led change. A healthy relationship between nature and communities across New Zealand. People tell us they’d like to know their neighbours better and improve the environment. They wonder what can they do – especially locally where they can see and benefit from the changes. Existing community groups feel they could achieve more – but how? Gecko’s purpose is to support both communities and community groups, using innovative and creative tools we have developed, to achieve their specific goals. Our philosophy is to support community and community groups to achieve their goals instead of doing it for them. Where there is a need, we aim to build the capacity of others to help them help themselves. We believe the integration of ecological and community wellbeing is essential in order to create a strong, healthy and dynamic relationship between people and nature. There are so many ways to be involved! For more information about our services or to see if we can help you, email us geckonztrust@gmail.com or visit https://www.facebook.com/geckotrust. We would also like to hear what you do – and what we can learn from you. Gecko works with communities in Auckland to develop a self-sustainable model of extensive community engagement that provides considerable social and environmental benefits. Email us geckonztrust@gmail.com or visit https://www.facebook.com/geckotrust to find out more. Ella Rose has a BSciHons in Geography and uses this critical thought in her work to explore the relations between and solutions for improving the health of environments and communities. Ella Rose’s background is in environmental project management, people coordination, sustainability strategy, campaigning, event organising, workshop facilitation and permaculture. In all of these areas, Ella aims to ignite people’s empowerment and catalyse ecological regeneration by building communities’ capacity. Ella Rose coordinates Gecko Trust’s team, relationships, projects, finances, systems and workings of the organisation. Outside of Gecko she’s an avid veggie gardener, beekeeper, cyclist and artist. Michelle has over 16 years’ experience working with organisations on sustainability. She has worked with industry-based groups and local businesses to improve sustainability outcomes for their operations and their local environment. Michelle enjoys bringing like-minded people, communities and businesses together to achieve mutual outcomes. She works to gather resources to support Gecko’s efforts and increase local business involvement in interacting with and restoring the environment. Rhyll has extensive experience in facilitation, training, supervision and coaching for capacity building and organisation development – primarily in the community, not-for-profit and public sectors. 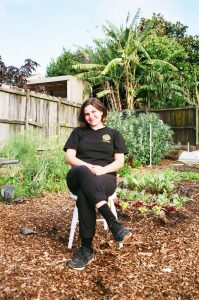 She has a strong commitment to ecology and organic practices and was co-founder of the Taranaki Training and Demonstration Garden and the Katikara Eco Community in Taranaki. Originally from the UK, Jenny joined Gecko in December 2017. Following a Masters degree in Ecology and Environment Jenny decided concentrate on sharing her passion for the environment and encouraging others to get involved. She has built up extensive experience over the last 15 years, working on both community engagement and outdoor learning projects with Natural England and The Wildlife Trust with a particular focus on building effective partnerships. Jenny has worked with communities to increase their connection to the natural environment through events, mentoring, communications and focused projects at home, at school, on farms and on local and national nature reserves. Jenny has been involved with environmental projects at all levels, from developing evidence based strategies and project planning to on the ground delivery, and brings with her additional expertise in events management and digital communications. Polly is currently completing a Masters of Environmental Science at the University of Auckland. She is interested in the relationship between people in cities and the natural environment, with a focus on water quality. Polly is involved in the Newmarket Stream restoration project as an intern facilitator and researcher. She is passionate about community engagement, education and action to protect New Zealand’s unique natural landscape. Richard is a community educator with extensive experience and knowledge of native flora and fauna, pest eradication, and bird monitoring. He is also author of the book Wonders of Natural New Zealand (Bateman 2007). Kelly is a ecologist and environmental consultant. She graduated from Unitec in early 2017 with a Bachelor of Applied Science – Biodiversity. She has particular interest in botany and lizard work which is a ever increasingly important topic in New Zealand. Kelly has extensive experience in vegetation surveys, avian monitoring and ecological assessments. She enjoys GIS as a complementary skill to ecology and fostering ecological passion in communities. In her spare time she enjoys hiking as many amazing bush walks that she can, admiring this beautiful natural world we live in. Charlotte is a communications consultant with 18 years’ experience. Her skills gained from working in the publishing, film and not-for-profit industries meet a broad range of communications needs – from strategy to media to community engagement. In addition to her work for Gecko she also contracts to Auckland Council on Project Twin Streams and a range of other clients. In recent years she has specialised in environmental communications, in particular helping community organisations liaise with their local communities. Email us at geckonztrust@gmail.com to get in touch. Joan is a Civil and Environmental Engineer. She graduated from Auckland University and now works for Watercare as a project engineer. She is passionate about sustainability and the synergies between humanity and the environment. She enjoys fishing, bush walking, beach exploring and hanging out in the outdoors and, as she lives in Laingholm the things she loves are right at her doorstep! Joan is interested in the social focus that Gecko nurtures that balances her technical background. Bruce’s career has focussed on delivering business support services and he has had experience in wide range of these services including finance, HR, IT, legislative compliance, contract management and administrative services. He enjoys delivering these services, ensuring that they are appropriate and meet strategic outcomes. A key skill Bruce provides is relationship building. He is an experienced leader and manager of teams, and describes himself as an open and trusted manager. Stephen is a strategic governance mentor and global business development professional. On behalf of the NZ government he developed the Global Leadership Development Programme run by the University of Auckland Business School, Thunderbird in USA and Icehouse. Chris co-founded Gecko, initiated the Wellington Conservation Corps (a youth development scheme using environmental projects as a tool) and spent 15 years as a key member of the Green Network team within the buzz of the Waitakere Eco City, and credits this for incubating many of his ideas and achievements. Chris is an innovator and champion of ecological restoration and community engagement. He has variously been tutor, guest lecturer, and member of the Industry Liaison team at several tertiary institutions; but it is the mentoring involving iwi and community that Chris enjoys the most. Fiona is a past Gecko Facilitator, qualified ecologist and has written several well-received weed strategy and planting guides for neighbourhood groups. She has supported communities to build capacity so they can sustainably manage their vision and plans for their place and now brings these important learnings to the board of Trustees. Warren has a passion for urban ecology and an interest in biodiversity, and joined Gecko as a trustee to work with like-minded people. He has a lot of experience in technology and strategy and is interested in looking at how to make technology more accessible for everyone. In his ‘day job’ Warren leads the Smart Cities Development for Auckland Council and has 15 years experience working as a technology architect.